Winner of a National Parenting Publications Awards (NAPPA) GOLD Award. Winner of a Mom's Choice GOLD Award. Named one of the Best 10 Audio-Visual programs of 2012 by Dr. Toy. Winner of The National Parenting Center's 2012 Seal of Approval. Recommended by the Parent's Choice Foundation. Parlez-vous cha, cha, cha? 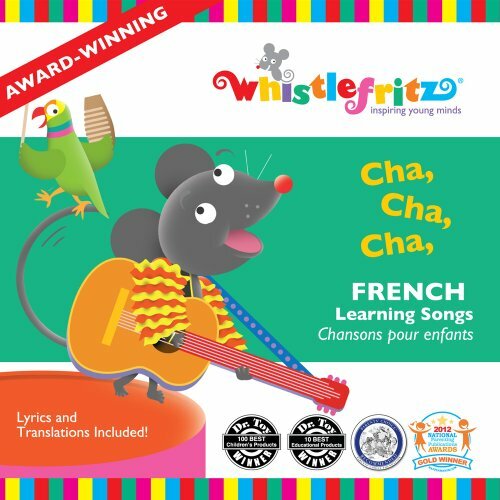 From samba and merengue to rhumba and reggae, irresistible world music rhythms add an exciting twist to learning French with this award-winning 15-song collection from Whistlefritz, the award-winning producers of language immersion CDs and DVDs for children. Sung entirely in French by acclaimed singer Lynn Véronneau and set to a diverse array of Latin and Caribbean rhythms by versatile bandleader and composer Didier Prossaird, Cha, Cha, Cha will get children on their feet singing and dancing along to colorful arrangements of beloved traditional songs (Bingo, Sur le Pont D'Avignon, Les Éléphants, Tombe la Pluie) and lively originals that teach about numbers, the days of the week, the months, the seasons, and more. This wildly fun collection makes learning to speak French as easy and natural as un, deux, trois. A song-by song translation guide is included as an easy reference guide for parents and teachers.